In a life filled with special moments, a few in particular stand out for me. Near the top of that list would be my annual trip to Hawaii and more specifically, the opportunity to photograph the Milky Way above an active volcano. I do this enough that it’s no longer novel for me, but it’s always special, and each time I get vicarious joy seeing my group’s reaction. And no Kilauea shoot was more joyful than this night. We started our night shoot at the Jaggar Museum overlook, which offers the closest view of the caldera. I got the group set up with their exposures and focus and we stayed until I knew everyone had at least one successful image. Its proximity to the caldera makes the Jaggar overlook the most crowded place to view Kilauea, so I quickly hustled the group to another spot a little farther back along the rim where I knew we could align the Milky Way with the glowing caldera. By that time a few clouds had started to move back in, but I reassured everyone that some clouds would add some character to the sky and reflect the color from the volcano. Little did we know…. Our second vantage point was completely empty, and the clouds couldn’t have been more perfect if I’d have commissioned them myself. For at least thirty minutes we photographed a jigsaw of cloud fragments drifting over the volcano, glowing like embers with the light of the churning lava but parting just enough to reveal the stars behind and frame the Milky Way. Waiting fifteen to thirty seconds for an exposure to complete leaves lots of vacant time, which we managed to fill quite easily with laughter. 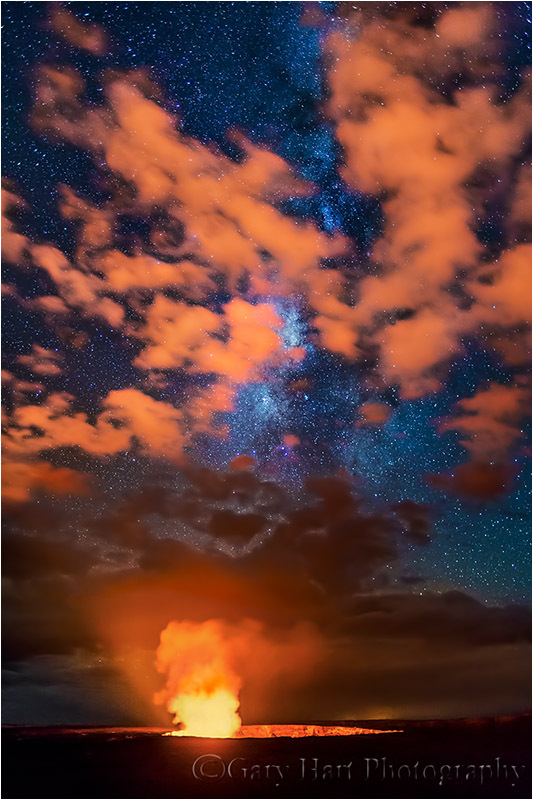 Despite the hilarity, everyone managed to keep shooting until the cloud pieces assembled and the Milky Way rotated away from the volcano’s glow. But not before everyone in the group had an assortment of images like this (and memories to match). Besides the amazing images, I think my greatest pleasure came from the spontaneous exclamations of joy (“Oh my God!”, “Wow! Wow! Wow!”) I heard from each workshop student when the first image popped up on their LCD. And for those dubious minds who don’t believe this image is “real,” I can assure you that this is pretty much the way the scene appeared on everyone’s LCD (and I have a dozen witnesses with their own images to prove it). To our eyes the scene was darker, not nearly bright enough for our eyes to discern this much color in the clouds (but no less beautiful). But boosting exposure to bring out more stars in the Milky Way had the added benefit of enhancing the caldera’s glow reflected by the clouds. WOW! Not sure if I like last year’s no clouds or this years some clouds better. And thanks for the reminder that it is time to book a workshop. Thanks, Tom. I don’t really do much special for humidity in Hawaii beyond frequently monitoring my lenses/filters for fogging. I use a plastic garbage bag to protect the camera from rain when walking around or waiting with it on a tripod, and shield it with an umbrella when shooting. I dress in clothes that shed or wick moisture (swimsuit or running clothes–no cotton) so my umbrella can be dedicated to the camera. I always have a towel with me in case I need to dry my gear. I also wipe down my lenses and gear at least once a day if I’ve been shooting near the ocean–lenses in particular will get a film on the front element when exposed to ocean air. What can I say Gary, that’s an outstanding shot. The previous comments have pretty much covered all the wows I intended! Wow! was my first response. Stunning! Amazing!!! Love your comments, too. WOW is right. this is now my favorite shot of yours. Thanks, Vince–right now it’s one of my favorites too.